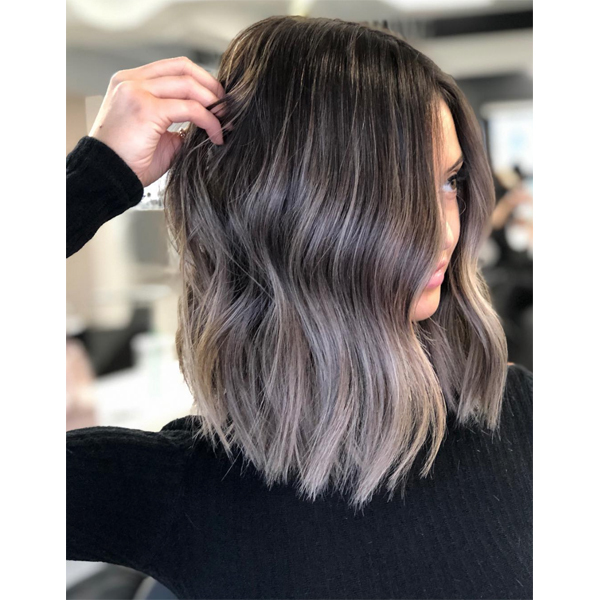 Whether winter in your area means 65° and light sweaters or negative temps and all the layers, one thing remains the same: clients want to ditch all the warmth in their hair in favor of something a little more cool-toned. So when we spotted this ashy brunette foilayage on Giancarlo’s (@gianhair) page, we knew we had to find out his process for you. Keep scrolling for the formulas and application steps! 1. Starting in the back, alternate between painting teasy lights and foilayaging with Formula A. Then, switch to Formula B as you work your way to the front of the head. Process until she reaches a Level 9. 2. Gently brush out the tease, then rinse. 3. Then, apply Formula C to Zone 1, Formula D to Zone 2 and Formula E to Zone 3. Use a wide-tooth comb to seamlessly blend all the formulas, then let everything process for 8 minutes. 4. Rinse, then apply Olapex No.2 and leave on for a few minutes before rinsing again. 5. Cut the hair into an on-trend lob, then blow-dry and finish by creating lived-in beach waves.